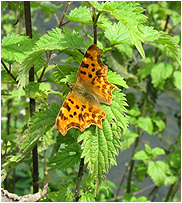 Someone from Mickle Hill arrived with a photo from her garden of a butterfly to be identified. 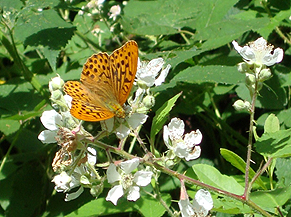 The very beautiful butterfly was a Silver Washed Fritillary. 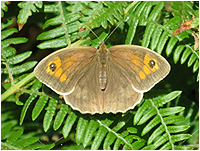 It is a large butterfly that glides as well as flying fast to chase intruders off its patch. Our first surprise was seeing a Silver Washed Fritillary near the balancing pond (A first for our butterfly count at Sandhurst). We searched the large meadow on one of the walks and the smaller meadows nearer the Blackwater river on the other. 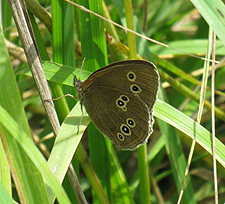 We found lots of Ringlets, some Meadow Browns and Large Skippers. That was the second surprise as we usually find mostly Meadow Browns and few Damselflies. The meadows are unusually still boggy this year so this may attract the Damselflies. The first walk also found black caterpillars on stinging nettles; evidence of Peacock butterflies. 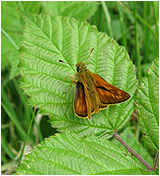 The second walk had a good sunny spell and we saw Commas and several varieties of White butterflies including: Small Whites and Green Veined White. Thanks to Colleen Pidgeon for organising the walks. We also found Damselflies and Dragonflies (including Azure Damselflies and Southern Hawkers).